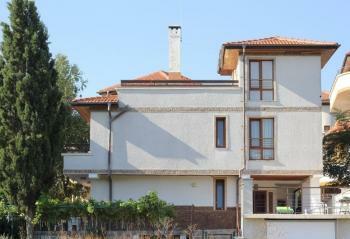 This is a newly built house for sale, located in the town of Byala. The property is set in a very quiet place, with good location and nice neighbors, 800 m from the sea and 400 m from the town center. The house has beautiful sea views. It has total living area of 280 sq m and a yard of 454 sq m. It is fully equipped and furnished with everything you need. There is external isolation and mineral plaster, natural stone decoration, PVC German windows. The terrace has granite floor, laminate bedrooms. All doors in the house are aluminum + glass. The house has three floors. On the first floor there is a large living room with fully equipped kitchen and a separate exit to the terrace, fireplace, room with washing machine and water heater, wardrobe and a bathroom. The second floor has three bedrooms, each with its own bathroom and covered terraces with sea views. The third floor comprises of one bedroom, bathroom and a large terrace - 35 sq m.
The yard is fully landscaped, planted with roses, grapes, trees, flowers. There is also a garage.